GuitAria reawakens the ancient combination of voice and guitar, producing sounds ranging from Renaissance ruminations and John Cage soundscapes to original collisions between art song and popular song. Alexandra Grabarchuk, when not singing in her sumptuous alto voice, chimes in on toy piano, while guitarist Peter Yates plucks, stomps and croons in accompaniment. The texts, including remarks by Mark Twain, Franz Kafka and Oscar Levant, pass through portals of humor into hidden realms of contemplation. Throughout, the self is presented as a changing point of reference, the meaning of life is derived from its opposite, and things in general are never as they seem. This album includes the cycle One Step Outside of This Gazebo, which depicts a diva's journey from self-involvement to awareness and acceptance, using paired voices, toy piano, foot-shaker and guitar in textures of fingerpicking, rock 'n' roll (if it modulated four times in seven measures), imaginary folksong, reimagined cabaret, and tolling chimes of inevitability. From sour agitation to calm beauty, the story caroms its way along to the final words: "It ends." Songs by Juan Vasquez, John Cage, Händel, Guillaume Dufay, Monteverdi, and Peter Yates. 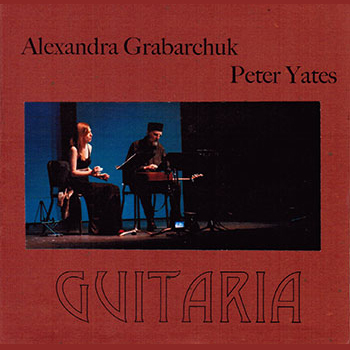 Alex Grabarchuk, voice and toy piano; Peter Yates, guitar, voice, percussion. I love the sound of this recording. The balances are just right, and everything is played and sung so soulfully. Alexandra's voice is shown off at its best as is Peter's. And the guitar sound is enticing—just the right balance of warmth and flash. The songs are top-drawer—first rate. Vasquez: Con que la lavare?